I must admit, I've been pretty slack at watching movies lately. Away We Go (2009) is a comedy directed by Sam Mendes (wait, did I just say that?!). Even for me, it's pretty hard to believe, considering his last film was Revolutionary Road, which was probably one of the most depressing movies of all-time. And by the look of his imdb.com profile, Mendes has never directed a comedy. Really? Sam Mendes directed this?? Burt (John Krasinski) and Verona (Maya Rudolph) are a couple in their 30's who are expecting their first child together. They decide they need some moral support to parent this child, so they go for a trip across America to find everyone they knew that might help them in the future. But their journey proves that they just need to find a place which feels like home to them, instead of just going with everyone else. 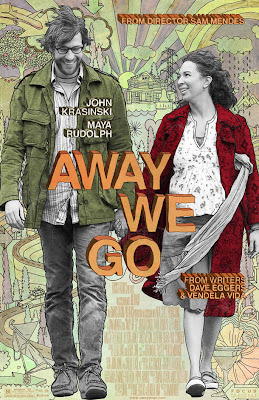 To be honest, I think this film is trying to be a grown-up version of Juno. I mean, look at the poster...looks familiar, doesn't it?? The film is by no means a great one, it has it's funny moments, and those funny moments come from the support cast--especially Allison Janney and Maggie Gyllenhaal. Maybe this isn't the film that can really prove that Sam Mendes can direct a comedy, but maybe a few more go's could get him to strike comedy gold? But overall, it's a charming, heart-breaking sort of film that you watch then forget about.